As a researcher it's all too often (or may just often enough) that you find yourself pouring over some obscure publication, peeking into corners, squinting at grainy old photos, hoping to uncover some amazing heretofor unknown treasure. It's the forever pot of gold at the end of the rainbow. Friends, I'm here to tell you I found one earlier tonight. While browsing a pleasant but hardly promising looking little 1972 booklet called "The Walt Disney World Story", I found it. Look, can you see it??? It's the STOL PORT logo!!!!!! I have never ever seen this before. I've talked in the past about Walt Disney World's amazingly cool old emblem system, and even gone so far as to suggest that the Golf Resort had the most amazing logo, but this one just beats them all. It's beautifully designed, relentlessly obscure, and amazing. 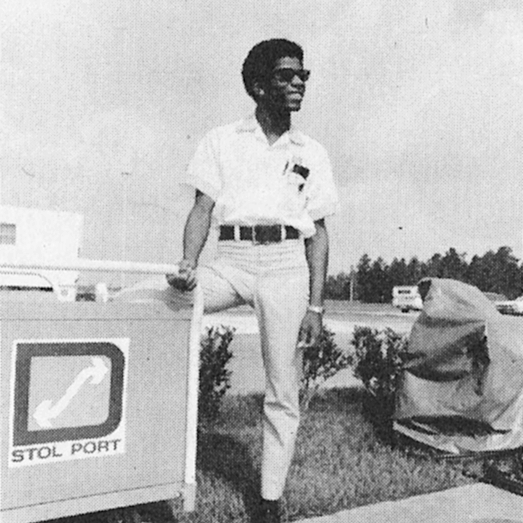 I'm going to assume that you know all about the STOLport, but if you don't, there's an excellent primer available here. We can't be certain of the colors, but I imagine the "D" is that lovely dark forest green on some sort of earthtone brown with a white arrow inside.